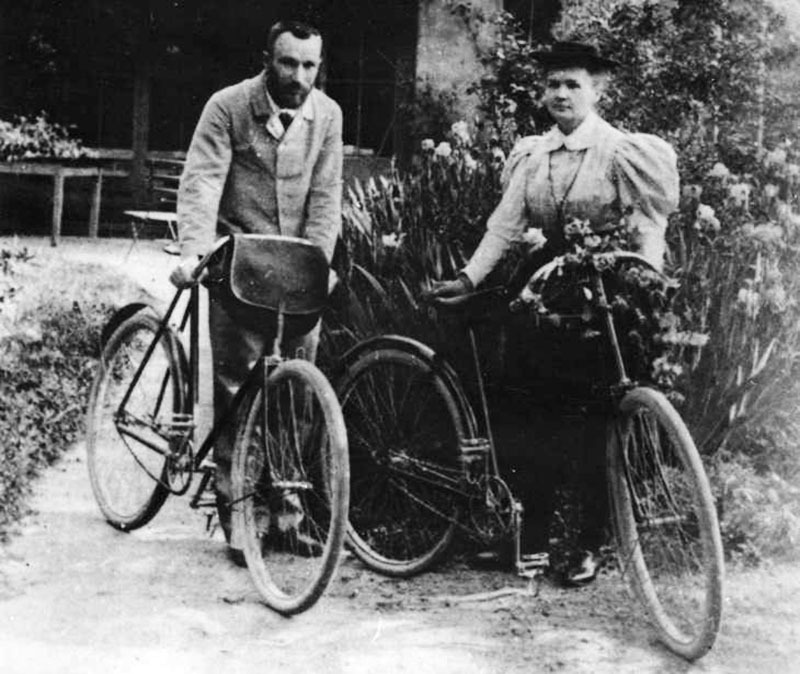 Sienkiewicz jokingly associated cycling with the wheel of fortune, Prus persuaded Żeromski to try the new sport, and Skłodowska-Curie chose the bicycle as a means of travel on her honeymoon. 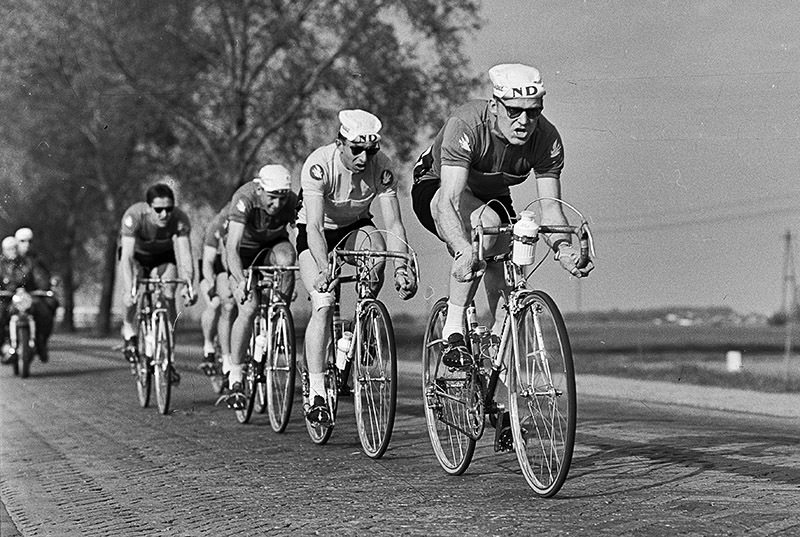 Culture.pl presents an array of anecdotes from the chronicles of Polish cycling. 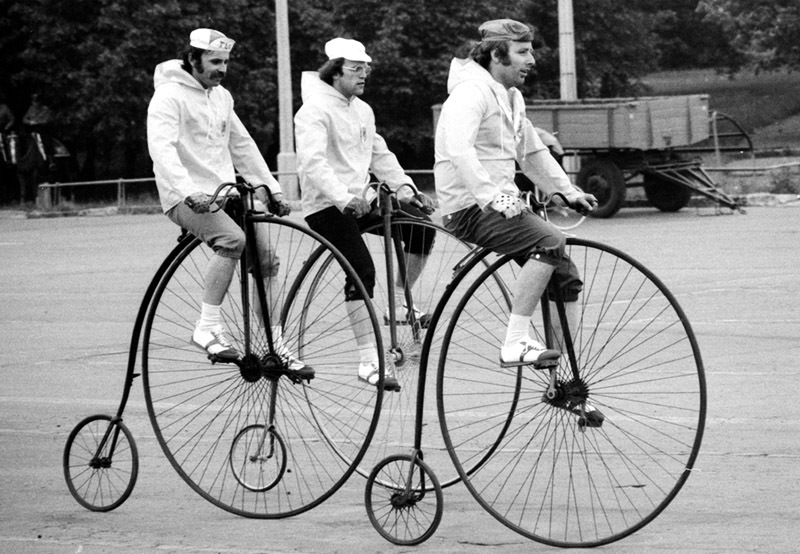 Before the bicycle, as we know it was first constructed, a wave of its various prototypes spread across Europe. In 1866, Warsaw witnessed the first sensational three-wheeled vehicle powered by human legs, designed by the painter Edmund Perl. The astonishment of local citizens was huge. Crowds gathered in the streets, and in their admiration, the poor fellows of Lviv didn’t dare attack the sportsmen, afraid that cyclists were in collusion with evil spirits. Inspired by these new machines, carpenters and various do-it-yourselfers soon began building vehicles of their own, which were usually quite uncomfortable and also somewhat dangerous. The cycling boom began for good in the 1890s, with the popularisation of the steel, rubber-wheeled bicycle. The year 1886 was a break-through, with cycling organisations founded in Warsaw, Łódź, Kraków and Lviv. By 1895, bike lovers even had press of their own. In Lviv, it was the Koło (editor’s translation: Wheel) magazine, while in Warsaw the paper was called Cyklista (editor’s translation: The Cyclist). 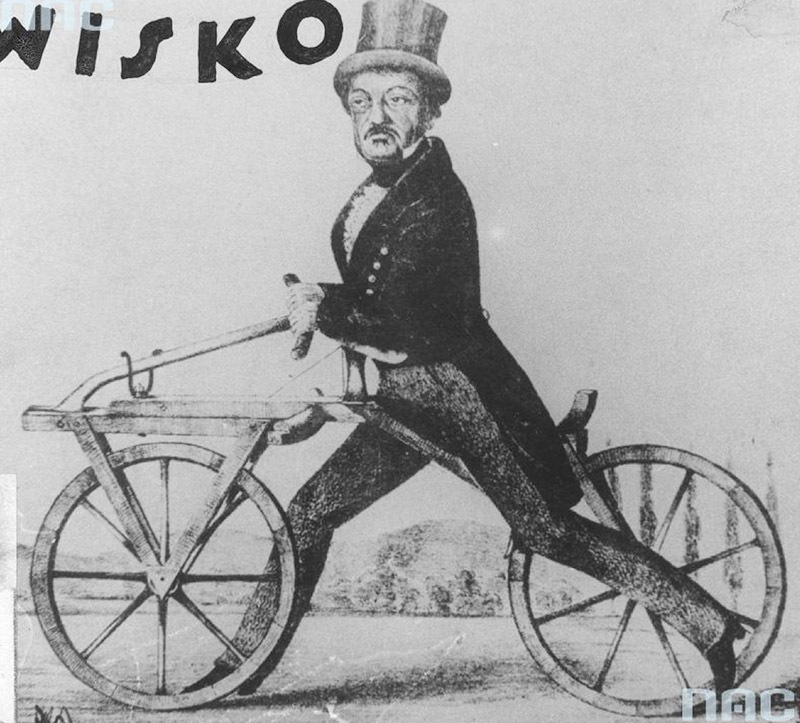 The new vehicle brought with it the problem of its name: at times it was monikered the velocipede, but also samochód (used as the word for car today, literally means ‘self-walk'), samojazd (self-ride), kołoped (wheelo-pede) or just koła (wheels), and bicykl. Under the Prussian partition, it was called Fahrrad or Niederrad. Sceptics used the nickname kościotłuki, literally meaning bone-shatterers – which, to be honest, was no exaggeration, considering the first bicycles’ construction. At the turn of the 19th and 20th centuries, the word rower gained popularity. It was derived from the English rover, as well as the actual name of a British company which produced bicycles, among other things. Perhaps I am mistaken, but before anyone corrects me, I will continue to believe that the bicycle is one of the most wonderful machines of the 19th century. Even if steel railways give us the travelling speed of 30 versts per hour, they also condemn us to a flying prison, which can be neither stopped nor departed from, and which must be shared with company that doesn't necessarily fit my taste. With the bicycle, on the other hand, I can move at the speed of 20 versts per hour (mind you, in my case, it's actually 8 versts), I ride whenever I want to, I dine or rest wherever I want, and I don't have any neighbours. Prus took up the theme of cycling on numerous occasions in his columns. He even wrote a short story entitled Ze Wspomnień Cyklisty (editor’s translation: From the Memoirs of a Cyclist). He is also said to have persuaded Stefan Żeromski to ride a bicycle. It is then no wonder that in 1894, Prus became an honourary member of the Warsaw Cyclists’ Society (Warszawskie Towarzystwo Cyklistów or WTC), even despite his agoraphobia, which stopped him from travelling very far. His writing nemesis Henryk Sienkiewicz kept up with Prus in this domain and joined the society three years later. In his opening speech, Sienkiewicz jokingly associated the bicycle with a wheel of fortune, as he wished the new society the best of luck. Wacław Gąsiorowski was another writer from the cyclists' milieu. Although his name is somewhat forgotten today, back in the day, he was a hugely popular author of historical novels for youth. The society’s legal history is connected with Gąsiorowski. The Tsarist authorities didn’t want to officially register the society since they knew that various patriotic events were in fact organised under the guise of cycling tourism: the society often organised special excursions to places of a historical significance for Poland. Gąsiorowski’s knowledge of the Romanovs’ court traditions proved useful in this regard. A self-taught historian, he knew of the unwritten rule in force at the time: anything that the Tsar’s eye saw became legal and had to be tolerated. Using this loophole, he pulled out the Cyclists’ Society banner during Tsar Nikolai II’s passage through Warsaw. Legend has it that the Tsar looked at it, hesitated, and then finally saluted. The behaviour of the crowds and the names they call us, such as lunatic or Lucifer, were, in fact, the smallest obstacle. What was a lot worse was the misconception prevailing among intellectuals, namely that our sport is inappropriate for people of a certain age and social standing. But today, (…) this misconception has been shattered. The enthusiasm for the sport, clearly manifested by the Eskulapa group, brings us the greatest joy because it eradicates all of the health and hygiene-related doubts proclaimed by those who oppose sports. We already have some 20 doctors in our society, and they are sportsmen of a true calling, real fanatics of the bicycle. In the late 19th century, the columnist Aleksander Świętochowski predicted that a rise in the bicycle's popularity would contribute to the democratisation of societies. It sounds like a beautiful concept, indeed, but for many years this before this process actually took place in Poland, the bicycle was toy for rich men in large urban areas. The cyclists’ associations were exclusive and rather closed (in order to be admitted, one had to know two members ready to vouch for the applicant). The associations formed a subculture of their own, with special attire and degrees of distinction. 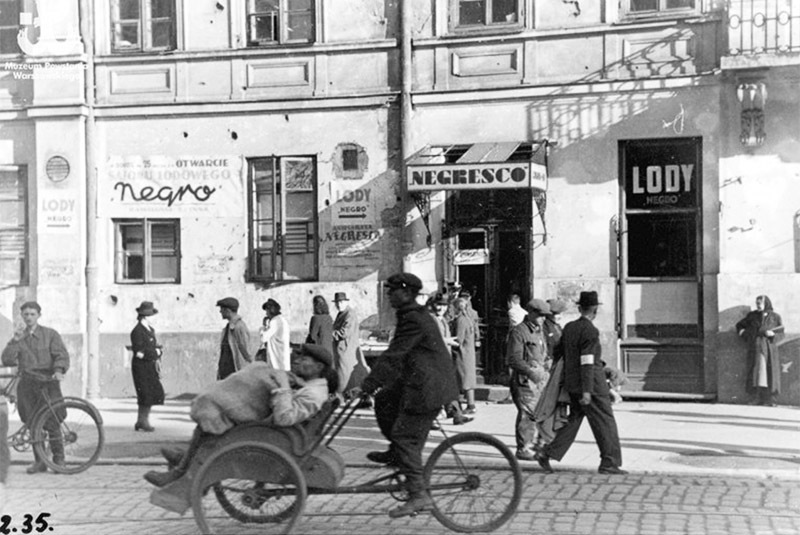 The situation began changing during the time of the Second Polish Republic, although the bicycle still wasn’t an affordable commodity. In her series of reportage stories entitled Usypać Góry: Historie z Polesia (editor’s translation: Pilling Up Mountains: Stories from the Polesie Region) Małgorzata Szejnert recounts the story of a peasant named Vasilyi Ilitchuk. In the 1930s, this man wouldn’t put up with cycling being a sport reserved for the lords, so he went and built a bicycle of his own. - Do you know who these ladies are? In spite of these allusions and prejudices, bicycles played a significant role in the emancipation of women. Afterall, this vehicle gives freedom and independence of movement to the person riding it, while the act of pedalling is a manifestation of strength. Cycling also revolutionised women’s fashion, as uncomfortable and restraining corsets and ankle-long skirts gave way to the more practical cyclists’ attire. To the general dismay of mothers and ladies of high society, she began to ride the bicycle at the age of twelve. Back then, in Warsaw, the view of a young girl dressed in men's clothes and a jockey hat was a huge scandal. And this little suffragist not only rode around Warsaw but also trekked about the world and went places where she wasn’t sent to. She competed with men in cycling races, and won! The family cursed her, her friends looked down on her, and this circus-woman continued to ride her bicycle and beat world records. Since we’re on the subject of women pioneers, we cannot leave out Maria Skłodowska-Curie. The Noble Prize laureate was a great sports enthusiast. In order to take a break from work in the laboratory, together with her husband, she organised Sunday bike day trips around the vicinity of Paris and often set out on longer trips during the summer holidays. The couple also spent their honeymoon on two wheels. From one village to the other, and from one little town to the next, they visited the picturesque Ile-de-France area, riding around on their bicycles. They took as little clothing as possible – only the essentials – and they had no fear of constant rain, thanks to their huge rubber raincoats. 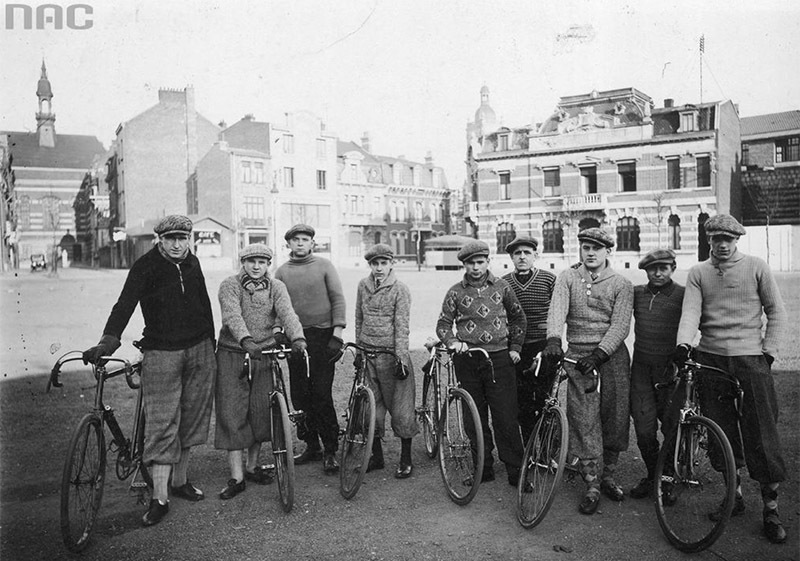 The twenty years of the interwar period were initially very positive for the cyclists’ movement. 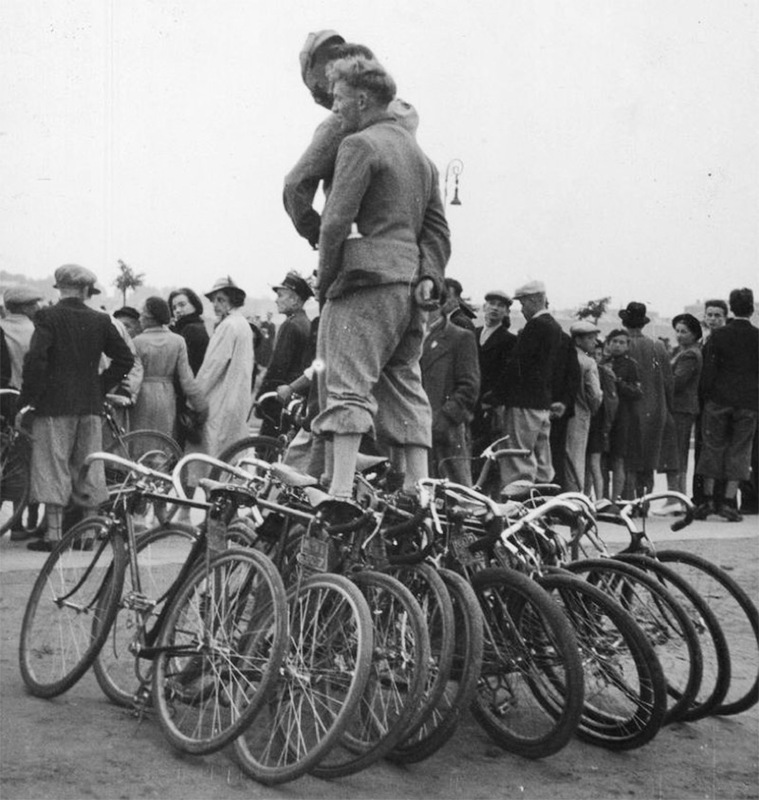 Bicycles became growingly popular. Some of the first Polish-produced bikes began to appear, such as the Warsaw Ormonde and the Łucznik from Radom (with a logo inspired by Władysław Skoczylas’ watercolour). In 1920, the numerous associations scattered across the three partitions finally came together under the name of the Związek Polskich Towarzystw Kolarskich (Polish Association of Cyclists’ Societies). Local clubs frequently created women’s sections. 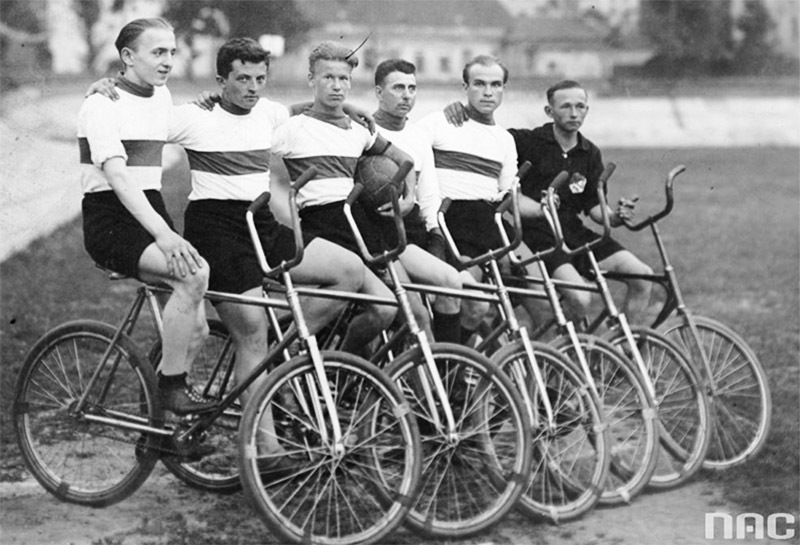 One major event was the victory of Polish cyclists during the 1924 Olympics in Paris. Another important episode in Polish sports history took place in 1928, the year of the first Bieg Dookoła Polski (editor’s translation: Run Around Poland) – the precursor of the Tour de Pologne. It was initiated by two journalists from the Przegląd Sportowy (editor’s translation: Sports Review) and activists of the WTC, Kazimierz Wierzyński and Henryk Butkiewicz. 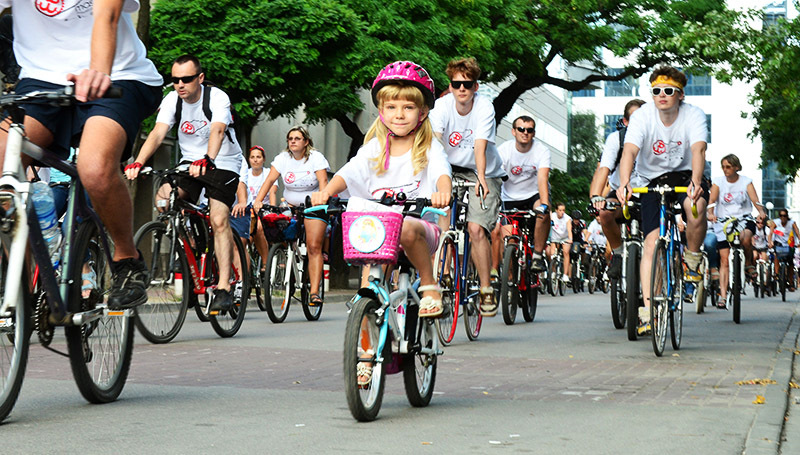 Przegląd Sportowy described the cyclists as: ‘a gust of wind encompassing the whole country with powerful youth’. The journalist and traveller Kazimierz Nowak set out on a solitary bicycle journey across Africa between 1931-1935. He started in Tripolis, and headed to the modern-day Republic of South Africa, and then back to Algiers. During his journey, he wrote and collected tons of reportage material from the places he visited, and he took more than 10,000 photographs. His work was later published in the Polish press. Members of the WTC also promoted Polish cycling abroad. One book which provides an account of his cycling adventures is Feliks Gołębiowski’s Rowerem do Azji Mniejszej (editor’s translation: Cycling to the Middle East) from 1932. People get around in the strangest of ways because trams are a real rarity. (…) I saw a young lady riding on a cake-delivery platform, pushed from behind by a bicycle. Adrenaline, the joy of doing something mature and adult, of putting up some resistance against the Germans. I was a fast messenger because I had a bicycle. A women's model. I would ride in a skirt, as girls only wore skirts back then. 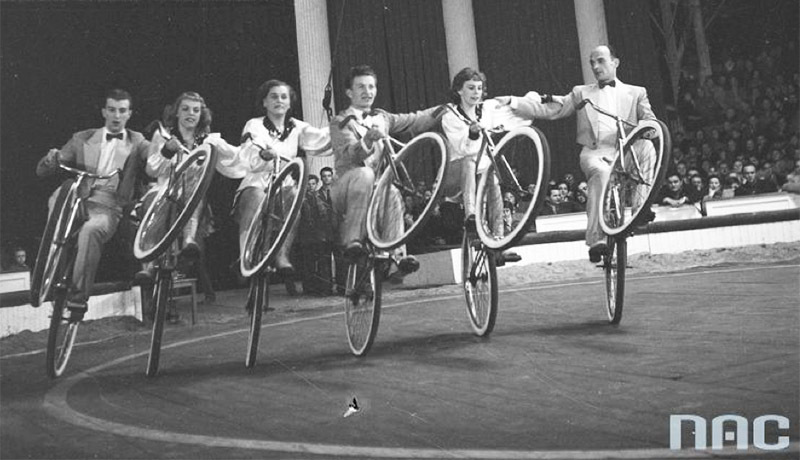 On the back wheel, there was a special net which prevented the skirt from getting tangled in the spokes. I put on a beret, and I sped across Warsaw. In the spring of 1941, when the city turned green, riding like that was pure pleasure. During the war, Polish literature gained a true bicycle piece, Andrzej Bobkowski's Szkice Piórkiem (editor’s translation: Sketched with the Quill). He actually ended up becoming a cyclist by chance – he had no other way of getting from the South of France to Paris, where his wife was at the time. 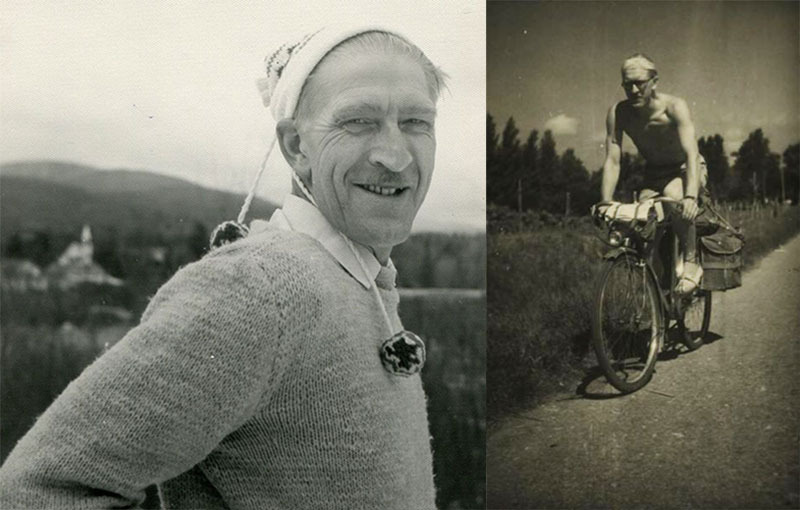 He was a huge fan of the new means of transport, and for a brief period of time, he also worked in a bicycle workshop. Bobkowski’s diary is filled with crazy slalom rides on Alpine roads, numerous chats with travelling companions, which are mixed in with the reality of occupied France and reflections on the condition of a war-torn Europe. Sometimes, when I am riding around on my bike at a crazy pace when the sun is shining, I am happy as I have ever been in my life. I have discovered the smile of thoughts. I can’t give it any other name. I feel like telling myself jokes, like being acting like a fool, I’m bursting with some silly joy and lightness. I like everything, and everything around me is like music. The moods of different streets and views caught in passing wriggle inside me like a dancing parade of couples, each wearing a different costume. The Warsaw–Berlin–Prague cycling race became deeply rooted in these cities’ customs. On the day of the start or the end of the race, the streets of Warsaw which were part of the route had the air crusades about them: huge crowds of excited people, running around in their best attire, hungry to worship the sports greats, ready to pay for this worship with crushed chests, broken ribs and completely ruined shoes. Reportage material from the time proves that Tyrmand was not exaggerating: the public's extasy can only be compared to the mass-madness of the golden era of rock and roll. However, it was not only the competitions that kept emotions running high. After the suppression of the Prague Spring, as part of their protests against the invasion of the Warsaw Pact countries, Czechs would put out drawing pins on the route of the race. In Warsaw, on the other hand, it was the victories of the Soviet team which resulted in tensions – in 1968 there were huge riots with thousands of people out on the streets and bottles, stones and burning newspapers being thrown at the podium. In 1986, the year of the Chornobyl explosion, the route of the race was extended to Kiev, in order to prove to the world that nothing had happened. Some of the teams protested and pulled out of the race. A little white dove logo was the symbol of the race. In 1955, various gadgets were distributed across Poland, such as bandanas, ties, cycling hats, silk scarves, cigarettes, and even chocolate bars, candy, and fruit salad, all bearing the logo of the Peace Race. Today, bicycle gadgets from the era found their way into contemporary popular culture. And so, reader! If you have money, get yourself a bicycle. Don’t think that some sort of devil resides in it, do not fear the difficulties of learning how to ride, do not underestimate it as a toy, but learn to ride and go out as often as possible, and as far outside the city as you can. In a short period of time, you will gain muscle mass, you will sleep better, have a better appetite and good humour, you will become a healthy and courageous person, and you will thank the undersigned person for having so fervently encouraged you in the year 1891.